After a few weeks of rumors, Google just announced the latest device in its Chromebook lineup: the Chromebook Pixel. Unlike previous Chromebook versions, the Pixel is aimed at power users who fully live in the cloud. The device features an impressive array of hardware specs. It has a 12.85 inch high-density 2560×1700 screen (that’s 4.3 million pixels) with a 3:2 aspect ratio, an Intel Core i5 processor and a whopping 1 terabyte of free storage on Google Drive for three years. Google will also soon launch a version with a built-in LTE radio and has partnered with Verizon to offer 100 MB/month for two years of mobile broadband and with GoGo to offer 12 free in-flight Wi-Fi sessions. Chrome itself, of course, has also been optimized for touch, which Pichai believes will soon be on every laptop. The menus are now larger and easier to click on with your fingers. 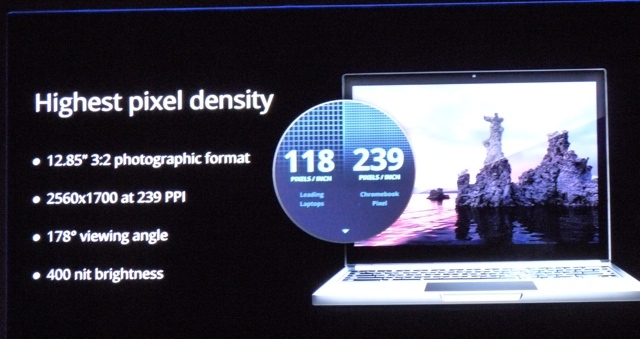 Asked about how the Pixel compares to the Macbook Air, Pichai noted that the Pixel has a higher resolution and a touch screen, something Apple doesn’t currently offer – especially on a 12-inch device. The price, of course, definitely puts the Pixel in a premium category and it remains to be seen how the market will react to it. It is, no doubt, the best Chromebook on the market today and the hardware, including the fit and finish of the device, is very impressive. At $1,299 for the basic version, though, some potential buyers may decide to opt for a premium Apple laptop or Ultrabook instead.